Thanks to all our Race Sponsors and Partners for their support and generosity. Please check out the companies that have supported the Grass Roots Racing on Aston Hill and click through to their websites to find out the latest on their products and/or services. Thanks again for all your support…. Mountain Mania Cycles have come on board as title sponsor. With 4 stores across the home Counties with the Tring store being right on Aston Hill’s doorstep with everything for the mountain bike enthusiast under one roof it’s great to have the support of Mountain Mania Cycle for this years events. 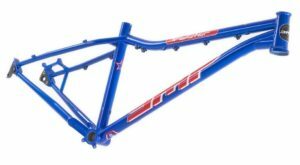 DMR Bikes have come up with the goods on this one putting up one of their legendary Trailstart Frame Sets for the winner of the Hardtail Category! Mudhugger mud guards do exactly what they say on the box! Keeping you clean no matter how muddy the trail gets. They’ll be providing their mud guards as prizes and spot prizes across the categories. OTEC Bikes are sponsoring the Vets Category and providing neutral technical support for competitors on the day to keep your bike tuned on race day. Visor Leaf are providing prizes across the categories their new biodegradable tear offs mean that if you don’t take them home (or the race organiser doesn’t pick up all of them after the race) you’ll be doing your bit to save the planet. VEE Tire Co will be supplying prizes across the categories and showing off their latest range of Tires in the Car Park. Saracen Bikes are supplying course tape and will have some of the 2018 range of bikes on display in the car park. Including the Myst and Ariel Downhill and Enduro Bikes. Long time supporters of Firecrest Mountain Biking and it’s Young Rider Development Programme – DeVo – it’s great to have the continued support of the Milton Keynes based brand. Out Skill The Risk is the only Brand relating to all sports out there “Out Skill The Risk” is a clothing and extreme sports wear company. They will be providing custom caps to the top 3 riders in each category. Firecrest MTB offers a range of Mountain Bike Skills Courses for riders of all ages and abilities. Offering skills coaching for first timers through to professionals racing nationally and internationally. Firecrest MTB are back organising mountain bike races in conjunction with the Forestry Commission and the Aston Hill Committee on Aston Hill in 2018. It’s great to be promoting and supporting local grass roots entry level downhill racing. Organised by riders for riders and providing an event for first time racers through to the seasoned downhill racer. Look out for more category sponsors and event partners signing up. Looking to get involved. Download our Sponsors and Partners Pack below and please get in touch!